Can My Dentures Be Permanently Placed in My Mouth? When most people think of dentures in Cocoa Beach, their minds go to traditional false teeth. Regular dentures are made of a gum-colored base that’s attached to artificial pearly whites, which may be made of porcelain or an acrylic resin. You have to remove them each evening and take extra steps to keep them clean. If they fit well, this type of dentures can be an effective way for you to restore your smile and get back to enjoying most of your favorite foods. You might wonder, though, if there is a better option. Is there a way for your dentures to stay in your mouth permanently? Your dentist can permanently attach your new teeth to the implants. After you heal from your surgery and your new teeth are in place, you’ll be able to treat them as you would treat the pearly whites that nature gave you. There is never a danger that implant-retained dentures will slip out of your mouth while you’re speaking or eating. They also provide a bite force that is strong enough to stand up to most (if not all) of your favorite foods. The implants can preserve your jawbone, helping to maintain the shape of your face. You’ll never have to worry about changes to your jawbone affecting the way your dentures fit. Implants give your smile a very natural appearance. No one will have to know that you’ve had some work done. 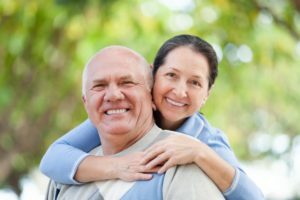 If you’ve tried traditional dentures in the past and have found them to be uncomfortable or ineffective, we encourage you to talk to an expert about your options. You may just find out that implant-retained artificial teeth are perfect for you. Even if it is has been quite a while since you lost your teeth and your jawbone has deteriorated, it’s still possible that you are a good candidate for dental implants. Your surgeon will strategically place your new tooth roots at the back and front of your mouth, in places where the bone tends to be the thickest. Therefore, it is possible that you’ll need just four implants to replace an entire row of missing teeth. Of course, you also need to consider finances. Traditional dentures may seem much more affordable at first, but most people need to get them replaced once every five to eight years, a process that can quickly drain your wallet. Since implants never need to be replaced, they offer a better long-term value. Want to permanently replace your missing teeth? We hope you talk to your dentist in Cocoa Beach about implant-retained dentures. Dr. Gary Nawrocki is your implant expert in Cocoa Beach, and he takes great pride in restoring his patients’ smiles. If you would like to learn if implants are right for you, please contact our office at 321-783-7514. Comments Off on Can My Dentures Be Permanently Placed in My Mouth?